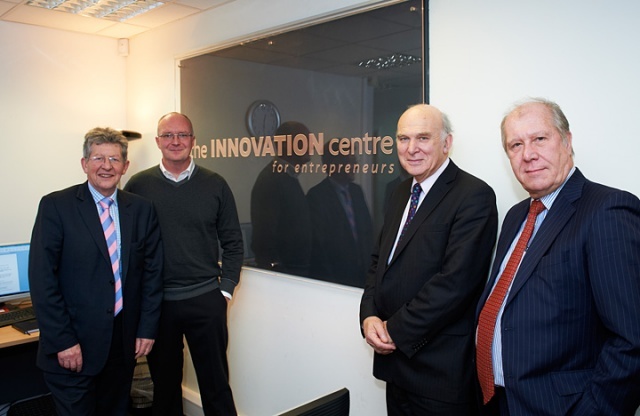 SETsquared’s Centre in Bath welcomed Business Secretary Vince Cable last week to hear about their work in the start-up sector and business support activities. Mr Cable was joined by Bath Liberal Democrat MP Don Foster and given a tour of the centre by Director Simon Bond and Rob Head, Director of the University of Bath’s Research, Development & Support Office. Centre Director, Simon Bond gave a presentation on SETsquared’s work in the start-up sector, and the Innovation Centre’s strategy to bring innovation and competitiveness to medium sized research-intensive companies in the local area. The politicians also met a host of researchers including Dr Andrew Dent from the Digital Manufacturing Lab and Dr Adam Joinson, Director of the Bath School of Management’s Interactions Lab. The Business Secretary was also very supportive of the new Bath Entrepreneurship Programme to equip the next generation of entrepreneurs with the skills they need to compete globally.